Health care was the dog that did not bark at Governor Andrew Cuomo’s combined State of State and budget address on Tuesday. Given the widespread support for a statewide single-payer plan in the Legislature, and the health coverage expansions recently announced by other Democratic governors and Mayor Bill de Blasio, Cuomo might have been expected to respond with a splashy proposal of his own. Instead, he called for appointing a commission to study “options for achieving universal access” and report back by December – a clear sign that he has no stomach for tackling the issue in this session. This review process will consider all options for expanding access to care, including strengthening New York’s commercial insurance market, expanding programs to include populations that are currently ineligible or cannot afford coverage, as well as innovative reimbursement models to improve efficiency and generate savings to support expanded coverage. Cuomo has said he supports single-payer at the federal level, but thinks a state-only plan – conservatively estimated to require a $139 billion tax hike – is not practical. Also notably missing from his spending plan was any reform of the notoriously dysfunctional $1.1 billion Indigent Care Pool, which theoretically compensates hospitals for charity care but distributes the money with little rhyme or reason. The health-related proposals the governor did include in his budget were relatively small-bore, such as requiring certain insurers to cover in vitro fertilization, bolstering an existing mandate for coverage of birth control and reinforcing and expanding the state laws that legalize abortion. Meanwhile, his administration’s efforts to control Medicaid costs – a success story in his early years as governor – show signs of falling apart. 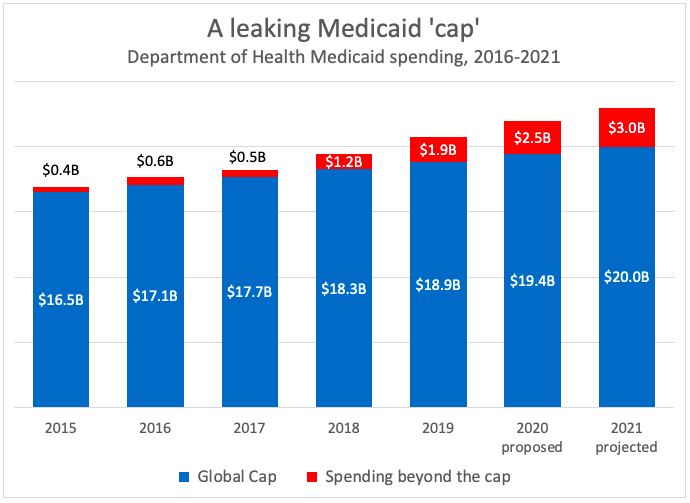 Medicaid: Cuomo’s “global cap” on Medicaid spending, a major accomplishment of his first term, loses more of its force – and relevance – with every passing year. It theoretically holds the growth of state spending on core Medicaid programs to the 10-year rolling average of medical inflation. In recent years, however, Cuomo has exempted an ever-larger share of spending from the cap, so that the actual growth rate has been much higher. This year, for example, the global cap is set at 3 percent (see p. 105 of the Financial Plan). But his budget calls for a 6.5 percent increase in spending on Department of Health Medicaid programs (see p. 106 of the Financial Plan). A major factor in that growth has been the minimum wage increase that Cuomo pushed through in 2016. The Medicaid system is reimbursing health-care providers for the additional cost of complying with the hike, a fast-growing expense that was exempted from the global cap. The state’s share is projected to be $1.1 billion in 2020 – or more than $2 billion if federal matching aid is included. In vitro fertilization: The governor’s budget legislation would require certain insurers to cover at least three cycles of IVF when medically necessary – but the mandate would apply only to plans covering 100 people or more. This could significantly reduce the size of the covered population, because most large employers are “self-insured” and exempt from state coverage mandates under federal law. Last year, Cuomo ordered the Department of Financial Services to study the cost and benefits of an IVF mandate. That study has not yet been made public. A similar law in Massachusetts has been estimated to increase premiums by $4.16 per member per month, or $200 a year for a family of four. The Legislature has been studying a broader mandate that would apply to all employee health plans that are not self-insured. 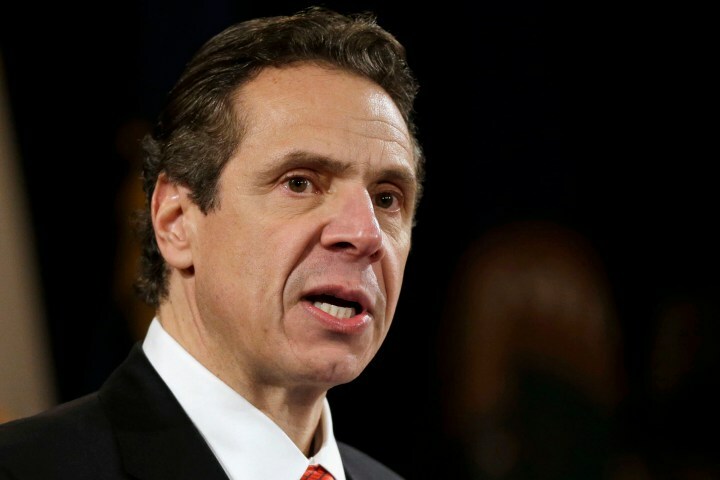 Cuomo’s proposal could be seen as a starting point for negotiations on a compromise plan. Contraception: Cuomo’s budget includes a version of the Comprehensive Contraception Coverage Act, which would bolster existing laws and regulations requiring insurers to pay for birth control without copayments or other cost-sharing. The version currently pending in the Legislature – which Cuomo has supported in the past – would add coverage for over-the-counter contraceptives, a category that would include condoms. It also eliminates cost-sharing for sterilization procedures, namely vasectomies and tubal ligations. 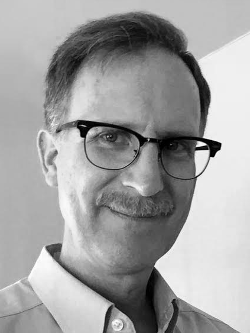 As written in the governor’s budget legislation, however, the act would exclude coverage for “male condoms” and apply only to “sterilization procedures for women.” The rationale for these gender limitations was not clear. The Legislature is expected to pass the contraception bill along with the Reproductive Health Act, which reinforces and expands abortion rights, on Jan. 22, the anniversary of the Supreme Court’s Roe v. Wade decision. If so, that would likely render the governor’s proposal moot. Health care was the dog that did not bark at Governor Cuomo's combined State of State and budget address on Tuesday. Cuomo wants to exclude male-oriented products and procedures from the Comprehensive Contraception Coverage Act.